Quorum cheaters – bacteria that shut down costly quorum-sensing regulated production of secreted molecules at the expense of others – are poster child examples of the recently emerged field of “sociomicrobiology”. Using Staphylococcus aureus as example, our research shows that quorum cheating is strongly suppressed during infection, except for in the special case of biofilm infection, when the enhanced biofilm formation of quorum-sensing negative mutants causes increased resistance toward phagocyte attacks. Our findings mechanistically explain the isolation of quorum-sensing mutants from biofilm-type infection and emphasize the limitations of in-vitro sociomicrobiology model predictions for the in-vivo situation. The emerging field of sociomicrobiology includes investigation of all forms of bacterial interaction, of which quorum sensing (QS) is probably the most intensely studied example. 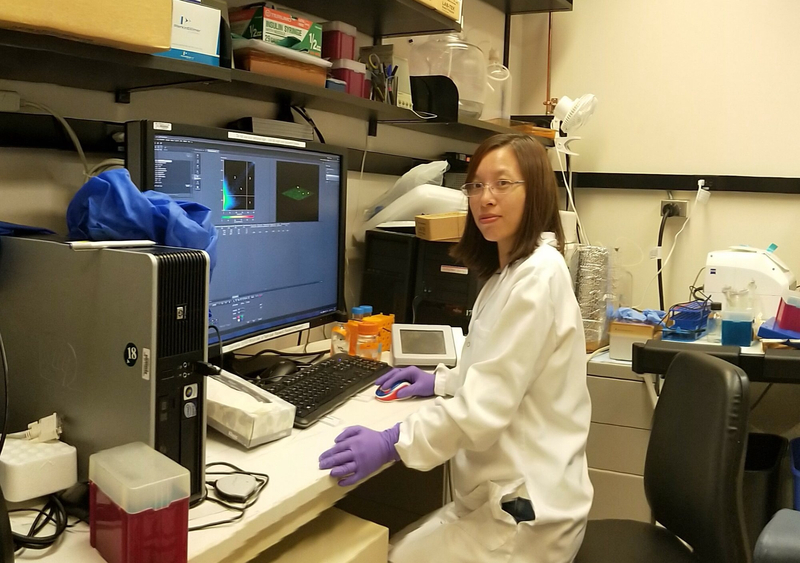 QS describes the sensing of the status of cell density and the subsequent regulatory changes in cell physiology that are aimed to deal with the altered environmental conditions. This includes increased production of degradative exoenzymes to acquire nutrients that have become scarce; and in pathogens, toxins to deal with innate immune defenses that have become highly alert by the increased number of bacterial invaders. 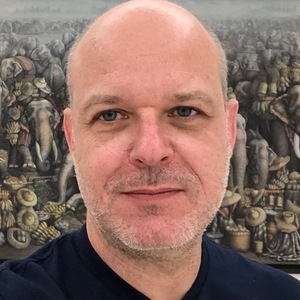 Having worked on QS and QS control of biofilm formation in staphylococci for many years, in our laboratory we had always been interested in two QS-related phenomena. First, we wondered why QS-negative mutants arise frequently in laboratory cultures. In recent years, several researchers have performed detailed investigation of this phenomenon and termed it “quorum cheating”. Quorum cheaters shut down QS control to save energy and rely on other members of the community to produce “common good” secreted factors. Of course, this only works up to a certain threshold, and in a closed system in-vitro culture, a balance between cheaters and non-cheaters ultimately develops. While most previous work had been performed in Pseudomonas aeruginosa, in our study, we found that quorum cheating occurs to a pronounced extent also in a wide series of unrelated Staphylococcus aureusisolates. In fact, quorum cheating occurs so frequently that in the laboratory one has to take special precautions not to falsely attribute a phenotype to a given gene locus that is in fact due to a secondary site mutation in a QS system. In research onS. aureus, whose QS system is called Agr, this has happened several times, with the discovered erroneous reports probably only representing the tip of the iceberg. The second question is related to the clinical observation that quorum-sensing mutants can often be isolated specifically from biofilm-associated chronic infection. This has not yet been explained mechanistically and prompted us to investigate quorum cheating duringS. aureusinfection. 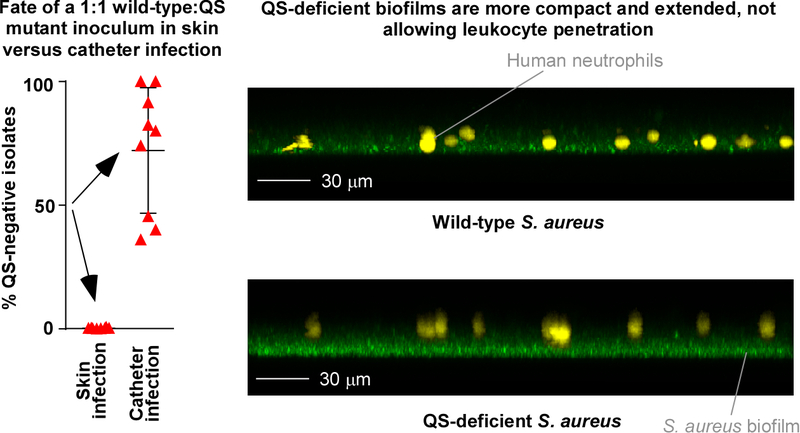 Strikingly, in non-biofilm (skin) infection, we never detected quorum cheaters and found that QS-negative strains have a dramatic disadvantage – which is easily explained by the QS-controlled toxins that S. aureusneeds for survival under those conditions. In biofilm (catheter-associated) infection, however, the picture was different. In that scenario, we detected quorum cheaters and found that they have a selective advantage. Ex-vivo investigation of S. aureusbiofilm-leucocyte interaction as well as in-vivo experiments using leukocyte-depleted mice explained this by increased resistance of the characteristically more extended and compact QS-negative biofilms toward leukocyte attacks, which evidently under those conditions overrides the advantages of toxin production. In summary, our study mechanistically explains why QS mutants are often isolated from chronic infections. As a more general implication, our findings emphasize that host-bacterial interaction in an in-vivo environment are of such importance that they may override inter-bacterial interaction phenomena discovered in vitro. They thus call for extended in-vivo investigation, in particular for the pathogenic bacteria P. aeruginosaandS. aureusthat have been used for sociomicrobiology research.